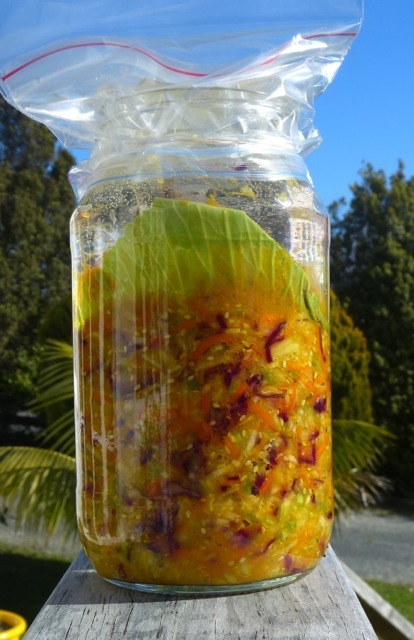 This entry was posted in Fermented food, KimChi, Pro-biotic foods, Raw Food, Sauerkraut, Uncategorized, Vegan Food and tagged apple cider vinegar, Auckland raw food, Chef Rene, Fermented foods, GAPS Diet NZ, Kim Chi, natural anti biotics, new zealand, raw sauerkraut recipe, Rene Archner, Sauerkraut, vegetarian, Vibrant Earth Creations by vibrantearth. Bookmark the permalink. Good Man! Let’s catch up when you are in Auckland! Hi Rene, I was at your crowed workshop in Horshamdowns which was great, really enjoyed the brine pickels. At the event someone asked you if one could use whole cabbages, I have whatched a Korean make KimChi with a whole chinese cabbage, whose leaves are slightly losser than the western type. She just opened the leaves from the outside in rubbing salt and spices (and fish sauce) in to the individual leaves. When she was down to the middle they completed cabbage was put aside for about half an hour before we ate it! Not everyone likes KinChi but I am mad for it and this one was very good. I do have a question; I noted that you used pink sea salt. I would like to try crude ground red rock salt (as used for animals) have you used it before? I have become conviced rock salt contains all the minerals one needs. 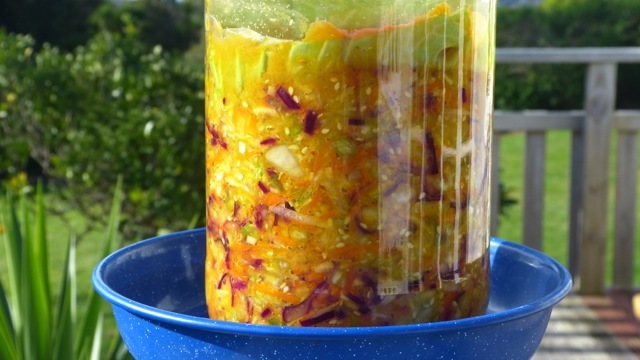 My understanding of KimChi (mostly read in Sandor Katz’ books) is that KimChi has to ferment (anaerobic process) over several weeks/months. It would be worth an experiment to play with loosely grown whole cabbages and pickle them in brine. If the salt is food grade, use it! I use the Himalayan Crystal Salt, New Zealand natural sea salt and also food grade Dead Sea salt. I really enjoy getting your emails with so many wonderful infos! We have really taken to the bone broth idea. I remember from my childhood, that there was no meal at my grandparents or great grandparents, without a bone broth and some contents that would hint towards the meal we were about to receive. A habit that has died, but I am sure was very valuable. Love and hug to you both and keep your infos coming.